BTS of 1x17 The New Normal. BTS of 1x17 The New Normal. Wallpaper and background images in the Maonyesho ya Televisheni ya Pretty Little Liars club tagged: pretty little liars season 1 episode 17 the new normal behind the scenes. 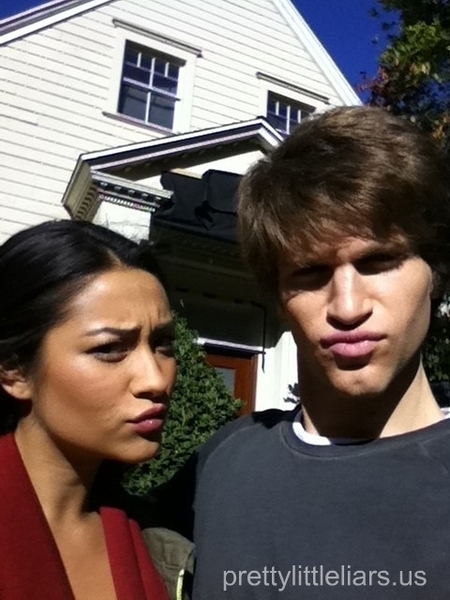 This Maonyesho ya Televisheni ya Pretty Little Liars photo contains bungalow and cottage. There might also be mitaani, mji eneo la tukio, mijini mazingira, jiji eneo, mijini kuweka, shule, schoolhouse, hip paa, paa hipped, hip roof, hipped roof, paa hip, and hipped paa.